I’ve previously talked about the importance of increasing communication between the sound community and our collaborators. This month’s topic provided the perfect opportunity to bring an outside voice to the Designing Sound community. 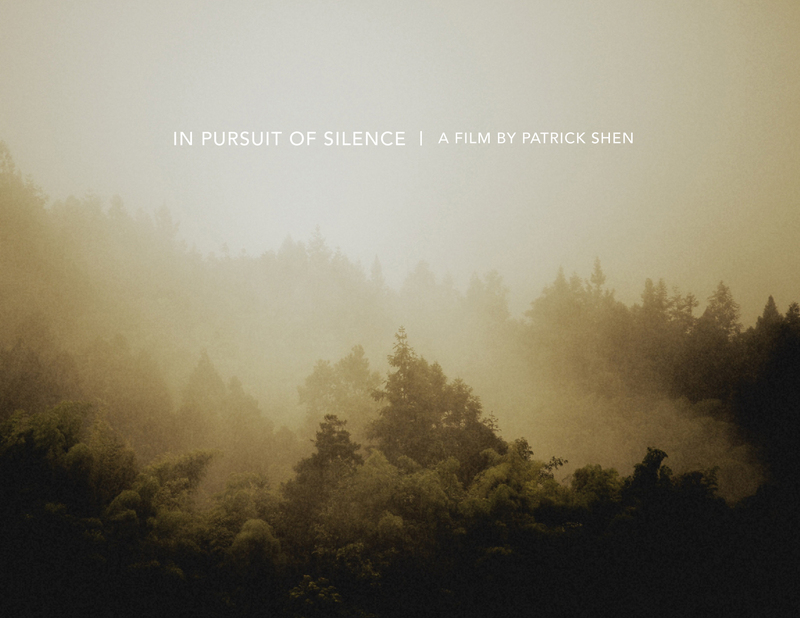 Patrick Shen is director of the documentary “In Pursuit of Silence,” and I’m happy to be able to bring you his thoughts on the subject! Would you mind giving yourself a brief introduction? I’m a filmmaker based out of Los Angeles. My first film Flight from Death was released in 2005. My fourth feature-length film In Pursuit of Silence will be finished mid-2015 and released shortly after. The mission statement of my film company Transcendental Media is “to agitate the sleep of mankind”. I tend to make films that are more thoughtful in nature, films that deal with themes that I hope have the potential to challenge and expand our worldviews. Kierkegaard spoke of the “immediate man,” someone who doesn’t belong to him or herself and recognizes “that he has a self only by externals.” He tranquilizes himself in the trivial. I like to think that my films are an attempt to snap people out of this cultural haze and the process of making these films an attempt at avoiding this inauthentic life for myself. There was a common thread between your last two docs, “La Source” and “The Philosopher Kings,” showing Janitors who are, in many ways, greater than their station in life. In Pursuit of Silence is pretty disconnected from that thread. What initially drew you to this idea of silence and the impact of sound in our daily lives? My first film was about death anxiety and how that influences our behaviors. My second film, The Philosopher Kings, was an attempt to take our cultural definitions of wisdom and heroics and flip them on their head. La Source was a bit of departure for me. That story found a way into my life and I had a moral obligation to share it with the world. I guess you could say that In Pursuit of Silence was partially inspired by a desire to return to my roots in a way, to get at something that will awaken our imagination of what living can look like. I’ve always been really fascinated with monastic life and the idea of devoting oneself wholly to something. When the film Into Great Silence was released in theaters back in 2007, I dropped everything I was doing to go see it. I caught a matinee and practically had the entire theatre to myself. For those who are unaware, the three-hour film features no score and virtually no dialogue. It’s a truly immersive experience and possibly the closest we can come to life on a monastery. There was something really mysterious and intriguing about the silence in that film. I wanted to experience that ancient silence, the silence humankind has chased after throughout the ages. That sparked my curiosity and it just grew with my research which included the excellent book by George Prochnik, from which I borrowed the title for my film. I began to understand how quickly silence was going extinct and started to realize what the implications of this might be. Finally, there was all this really compelling data about noise and its impact on our lives and all of a sudden this living, breathing, 3-dimensional antagonist for my narrative began to develop. All of that gave me a framework within which to explore a possible film. Since beginning production after a successful Kickstarter campaign, you’ve been traveling all over the globe. What are the most unique acoustic environments you’ve visited, on both ends of the spectrum (noisy and quiet), and how did they compare to your expectations? The anechoic chamber at Orfield Laboratories in Minnesota is definitely one of the most unique acoustic environments I’ve been in. With a decibel reading of -13 decibels, it’s been awarded the distinction of being the quietest place in the world. Nearly 200 million times lower in acoustic intensity and approximately 128 times quieter in perceived volume than an average downtown street, the chamber is 13 decibels below the human threshold of hearing. Initially, I just really appreciated being able to have a conversation with someone without all the effort. We’re used to speaking with people amidst all sorts of sounds which not only muddy the mix, but overload our cognitive faculties which can all make for a pretty exhausting conversation, not to mention result in miscommunication. It was refreshing to be able to connect to my surroundings in such a pure way. It sounds strange to say, but I felt more alive in some way standing in that chamber, as if I was all there rather than feeling like I was battling and reacting to a thousand different things happening around me. As for noisy, I’d have to say the pachinko parlors in Japan take the cake. Pachinko parlors are known for being incredibly loud and also very addictive places. Each year, a handful of kids die from heat exhaustion while they sit in a car waiting for their parent to get there daily dose of pachinko. Coming in at 97 decibels on our sound level meter, the noise in this particular parlor was thunderous and violently loud. There’s thumping music pumping from speakers way too big for the space mixed in with the constant clanking and ringing of the pachinko machines to create a constant wall of sound. We learned later that parlor owners will often broadcast yet another layer of noise, an artificial soundtrack of machines clanking to give patrons the illusion that the place is packed and happening. You have no choice but to lose yourself in the machines and numb your senses in order to deal with the onslaught of noise. I only spent about 15 minutes in there (just long enough to get a quick audio recording and a few shots before getting kicked out) but people will spend hours in these places. As a former metal guitarist, I’ll always have a soft spot for loud, but pachinko parlors are a different animal. What methods are people and organizations using to combat noise pollution? Are there personal approaches that people are using for their individual lives, or are all efforts on a moderate to larger scale (along the lines of Gordon Hempton’s One Square Inch of Silence)? Prochnik talks about how silence has become a rich man’s reward. It’s true that if you have the means, getting away for the weekend or the month is a fine temporary solution for respite. Many are seeking help from acousticians to soundproof their homes. For the financially less fortunate, who often are forced to live near train tracks or under flight paths, there is no easy solution. Many of them are forced to simply live with the cognitive overload and adverse health effects that noise can cause, an economic tranquilizer of sorts. There are stories all over the globe of citizens seeking compensation from developers and city officials – some successfully, others not – for being forced to deal with some sort of environmental or transportation noise. I also once heard of a man who integrated the rhythm and frequency of each plane passing over his home into his daily meditation. So, there are solutions for the individual, but not accessible to everyone. Long term solutions definitely need to take place on a much larger scale. Politicians need to get involved to improve and enforce noise codes. Consumers need to start purchasing quieter products. There is a lot of interesting work being done in the field of noise control where engineers are working to quiet everything from lawn mowers to jumbo jets but there’s a long way to go. People need to start caring first and I think that’ll begin with awareness of why this all matters. What is one thing you’ve learned in the course of production that you feel everyone should understand? Noise can kill. Several highly regarded scientists we’ve interviewed have confirmed that potentially hundreds of thousands of heart attacks around the world are likely caused by noise. For those dealing with some sort of chronic noise problem, it’s likely taking its toll on your body and some action needs to be taken. If you’re already in poor health, noise can be especially damaging. So, that’s interesting and clearly identifies noise pollution as a real environmental hazard that should be taken seriously. The World Health Organization actually ranks traffic noise as the second most dangerous environmental hazard, just below air pollution. I think something else for us all to consider is whether or not we’re content with the way our world currently sounds. Personally, I think it sounds pretty crappy. It’s a mess of noise, mostly unintentionally pumped into our environments and penetrating our ear canals against their will. We know – and the science supports it – that sound can affect our physiology, our mood, influence our behaviors, and affect productivity. So, why is it that we pay such little attention to our soundscape? Why do architects pay so much attention to the visual aesthetic of buildings and virtually none to their sonic qualities? Since it is so essential to the topic of your film, how has your personal approach to sound in a narrative structure been affected by this production? As many of your readers probably understand, sound can be a powerful storytelling device. Beyond creating an immersive and more realistic experience for an audience, sound can be used to inspire visceral reactions amongst your audience. With every turn of the plot, the sound must follow, reflecting shifts in tone, pacing, and overall mood. Music was my first love and so sound has always played a big part in what I do. I’m excited to explore this even further with our sound designer Steve Bissinger and build a soundtrack that is not just ornamental but truly experiential and taking viewers on a journey. Using Holophone mics mostly, I’ve tried to collect as many recordings of the environments I’ve found myself in during the making of In Pursuit of Silence and I’m planning to incorporate those into the film as much as possible to create an even more authentic experience. That trailer you put together for the film was incredibly powerful. Can you talk a little bit about that moment of silence and that day of production? I came across some epic images of people observing the moment of silence on Remembrance Day in the UK and really wanted to capture that for the film while we were there. There’s a pomp and circumstance to the way the British honor their fallen – it’s beautifully intense. Lloyds of London, the global insurance company, invited us to film their Remembrance Day ceremony during which every employee takes a break from their work, even letting phones go unanswered, to celebrate their fallen and observe 2 minutes of silence in this cathedral-like office building. It was incredible to witness this bustling office building and the accompanying thunderous hum from all the activity come to a dead halt. It’s like that silence you hear in an auditorium during a concert when the audience is so captivated that the silence between each note coming from the stage just pierces the room. We all have our own perceptions and beliefs. What is silence to you? The silence I find myself thinking about most often these days is not the scientific / zero decibels notion of silence, but silence as a metaphor for that thing upon which everything lies, the substrate of our living, breathing, day-to-day experience. Silence – even the zero decibels type – after all is ever present. There’s just so much piled on top of it, noise and otherwise, that we hardly notice it’s there. So much of what silence is buried beneath is trivial, a buffer between us and the real world. I realize I’m contradicting the title of my own film here, but I think silence isn’t something you find by pursuing it. A pursuit is by nature an active process. I think we start to see/hear silence as we withdraw from action. Perhaps to move forward we need to learn to stand still a little more often. I’d like to thank Patrick for taking time out of his busy production schedule to share his thoughts with us. 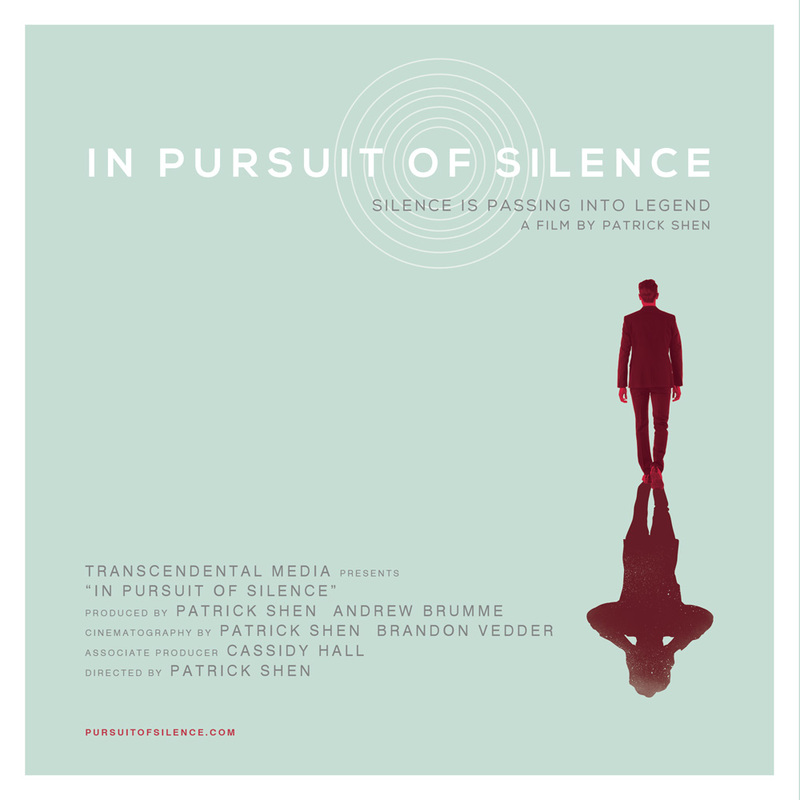 In Pursuit of Silence is still in need of support to see itself through completion. To that end, the film is available for pre-order on Blu-Ray or HD download, and other cool items are available at http://www.pursuitofsilence.com/support-the-film/. You can follow the progress of the film on Facebook or Instagram/Twitter at @iposfilm. Some weeks ago I had a job where we recorded a short scene, at the airport in Frankfurt a.M., Germany. On this day I realised how crappy some places can sound. I am used to noisy environments and some of them actually can sound beautiful, but this space had a very unpleasant mix of sounds , and I was glad when we finally left the building. On the other hand the central train station here, has a very pleasant sound, although it’s even louder there.